For someone growing up between opposite worlds of different countries, cultures and languages, a field of education always presented something that fascinated me the most. After many years in higher education, world travels and several languages, it still seems that education is a rather important and continuous process. And no wonder why one of my first road trips on my world discovering journey happened to be to Boston area, particular for its important part in the US history, many interesting and historic sights, as well as an impressive concentration of Universities and colleges. Boston metropolitan area is known for an impressive concentration of best Universities and colleges in the country and in the world. While trying to research the exact number of higher education institutions in the area, I came across various numbers, ranging as far as almost a double )) I decided to go with a more legitimate article, stating that the area accounts for 85 private institutions of higher education: Harvard, MIT, Tufts, Wellesley… and these are just to name a few. Quite impressive! 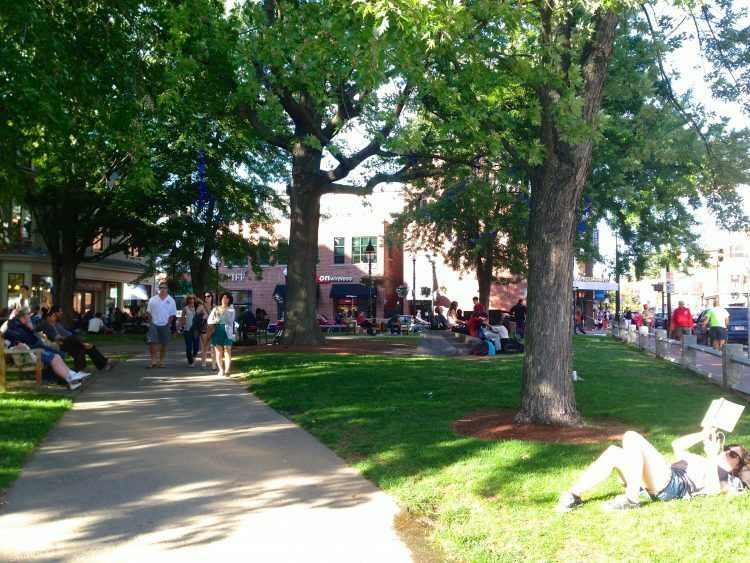 With many Universities and colleges in Boston area, you’ll certainly come across a few during your travels. Universities, liberal art colleges, women’s colleges, business schools… These higher education institutions offer their students outstanding options to choose from, and almost every college and University seems to have its own specialization. Some are known for their engineering programs, and others for their business, leadership, entrepreneurship, international and individual programs. Every time I travel, I try to visit campuses of local Universities and see with my own eyes what they look like, their location, programs and how they stand out in a worldwide educational field. Local Universities and colleges usually tell a different story about the city and the country, the one you might not be able to find in traveler guide books. If you ever happen to be in Somerville, stop by Foundry, and you would not be disappointed. It is very easy to find it because of its central location, I even happened to park right across from it. It was not as busy when I got there, but the place was packed a few minutes later. So getting there earlier might be a wise decision. The atmosphere of the place seemed a perfect combination of an american pub and french brasserie, the go-to place for casual get-togethers or a tasting of an extensive craft beer, wine and cocktails menu. And the food? Places like these give “being a part-time vegetarian” another meaning, and it speaks volumes in my gastronomy world! After my memorable dinner I strolled leisurely in Davis Square, wondering what it is like to live and be one of the students in the area. Next day started with my exploration of Cambridge area. Cambridge is a historic city north of Boston and it dates back all the way to 1630. 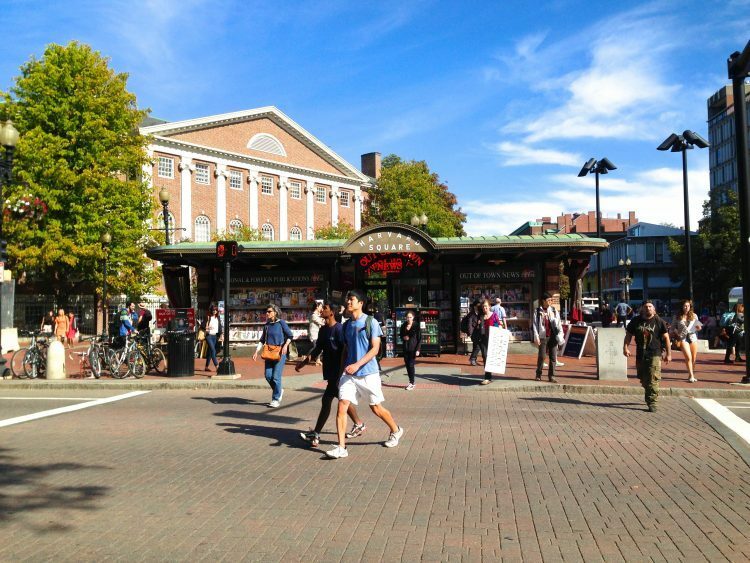 Although it is one of the most populous cities in the state of Massachusetts, it has a cozy feel of a small town, especially near Harvard Square. It was an early September sunny day, and on my way out of subway I was greeted by a very pleasant man holding a bright poster with “Free hugs” written on it. Well, I did not go for a free hug, but I got a very bright free smile, which is not bad either. 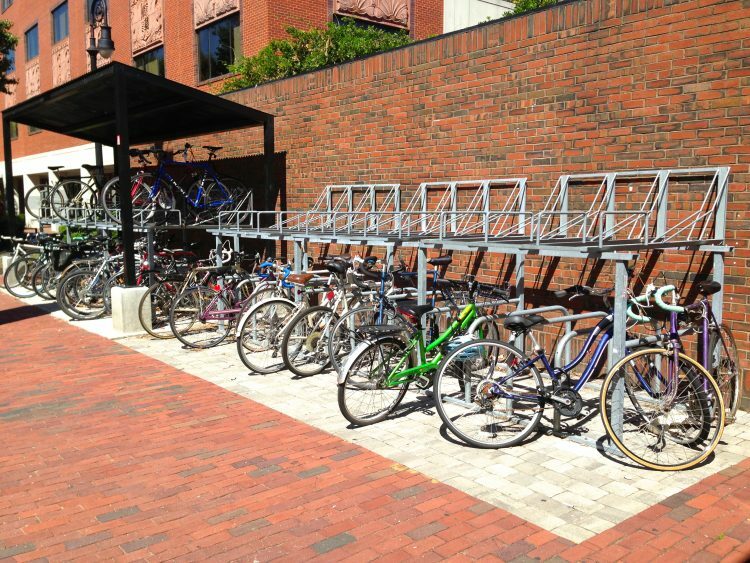 What an amazing way to great fellow residents and travelers also! And it did make my day! There are many things to do in Cambridge, but I would suggest getting a table outside and seeing Cambridge everyday life unfold right in front of you. Watch people pass by, sip an apple cider and listen to someone playing a recognizable melody on the guitar. Sometimes it can be a bliss! 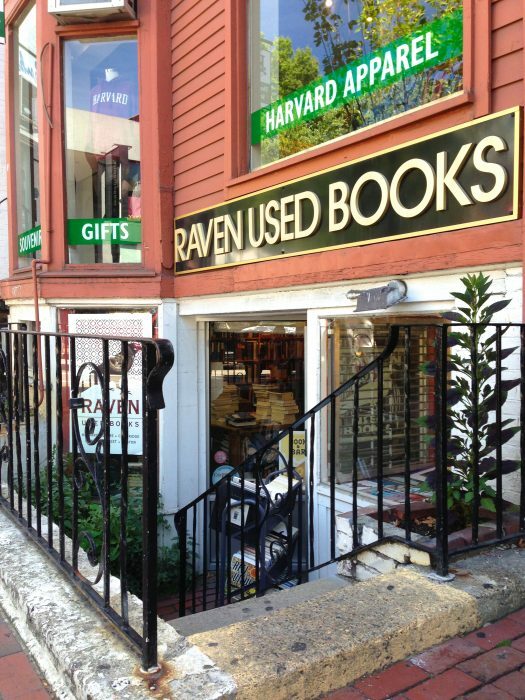 I wandered around the center soaking up the early fall warm sunlight and enjoying Cambridge architecture, while I came across a charming bookstore. Well, I keep finding them everywhere I go, and getting “lost” in bookstores is one of my favorite things to do during travels; and nothing can be compared with “gently used” bookstores, at least to me. Choices, colors, smell, texture… Oh, my! Anna Akhmatova?! World literature?! The rest of Cambridge was calling and off I went on another adventure. It was not my first time in Cambridge, so I decided to explore mostly the Harvard University area and joined the University walking tour. It was very interesting for me to find out what exactly makes this University elite, consistently keeps it in top rankings among United States Universities and in World Reputation ratings, and aspires many people around the world to choose it as their Alma mater. 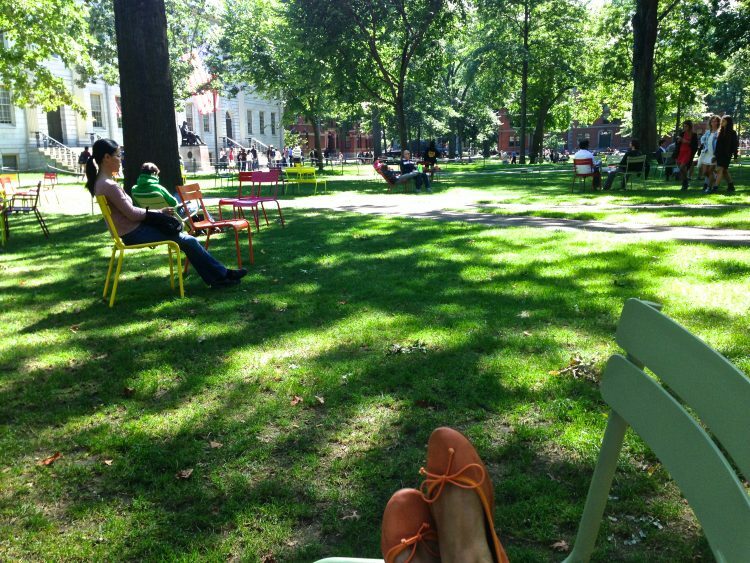 While waiting for my tour, I ended up sitting on one of many colorful chairs in the shade of the green trees with a view of the John Harvard statue, surrounded by historic buildings. On a bright sunny day, this was an obvious place to relax and recharge before going back to exploring and learning. Our walking tour guide happened to be one of the Harvard University students, and we actually found out not only the University’s history, but also his inside perspective and some personal stories. For someone studying at such an elite University, he struck me as a rather humble and down-to earth person… plus, entertaining and knowledgeable. 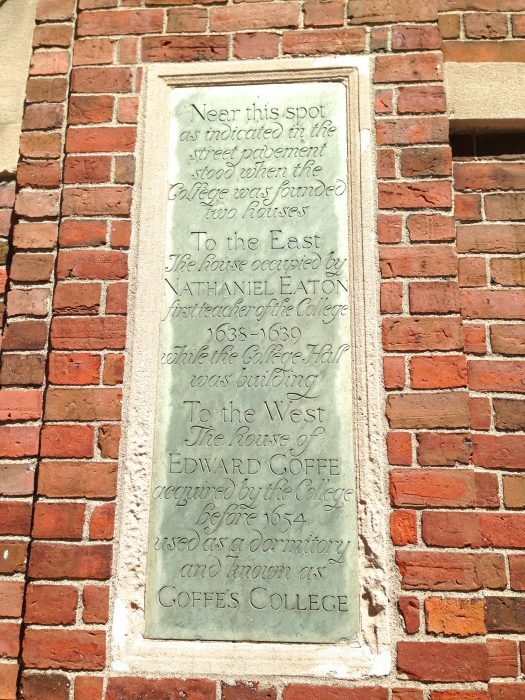 The University was named after the college’s first benefactor, a minister John Harvard of Charlestown. He left his library, which consisted of about 400 books, and half his estate to the institution after his death. The John Harvard statue is located in the yard, and is known as the “statue of three lies”. One of the lies consists in the fact that it is not exactly “John Harvard” himself, since there are no living representations of him left. The rest of the lies are revealed here, where you can also find out more about it and get immersed in a very fascinating symbolism of the University. 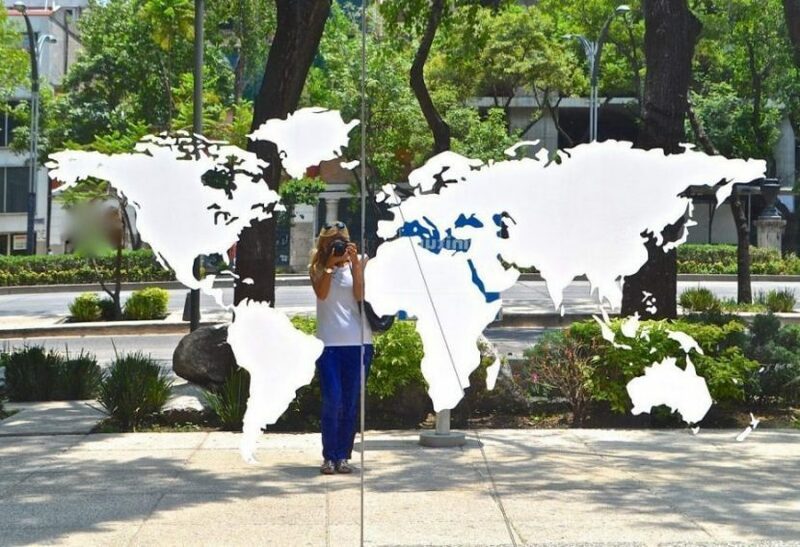 The statue itself was surrounded by many travelers, and there was an actual line in order to take a picture with it. 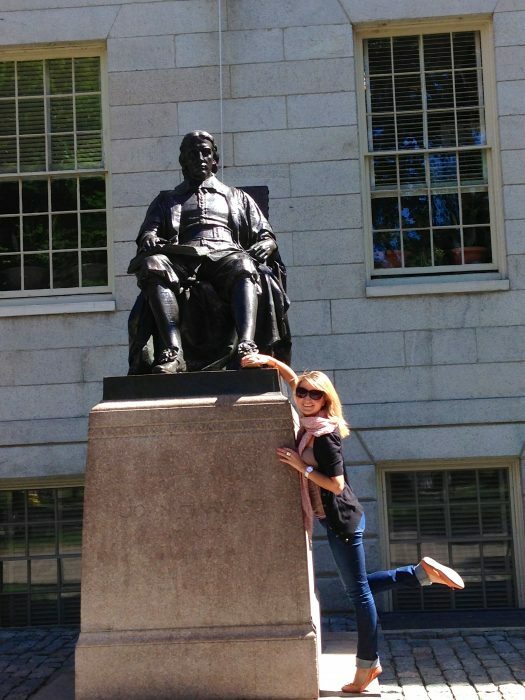 I will not suggest touching the boot itself while taking a picture, or rather not touching it at all )), and you will find out why when you join an amazing historic Harvard tour on your visit. 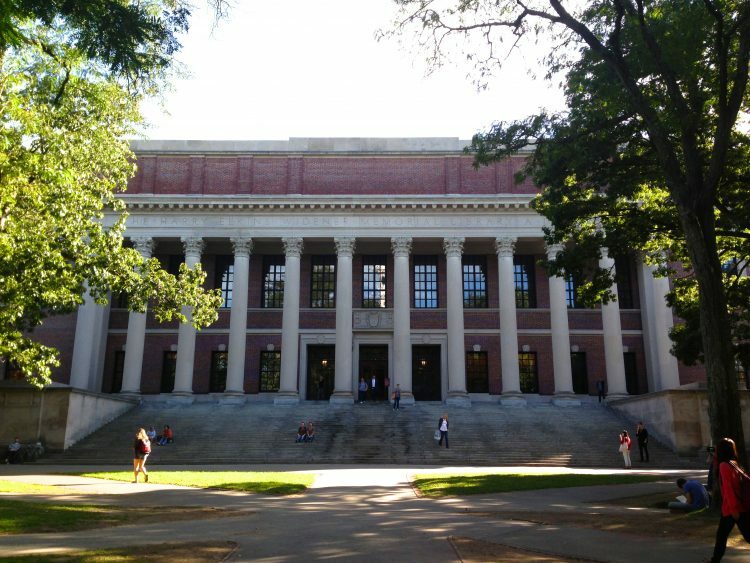 Harvard’s library is the largest academic library in the world with a remarkable collection of volumes, manuscripts and photographs. We wanted to take a quick peek inside the library, but it is not as easy as it might seem. Thankfully, our guide was kind enough to describe how it looks like with many particular details and personal stories. The library itself doesn’t look as big as you might think the largest academic in the world looks like, since most of it is immersed underground, just like an iceberg. We were looking at the library and listening about its amazing journey (can you believe Titanic had something to do with it?!) from the stage where many famous and influential people give commencement speeches at graduation. While the tour guide was telling us their names, I couldn’t believe I was standing there. It had nothing to do with their names or their status, but mostly with my profound respect for what they stand and for their remarkable accomplishments. 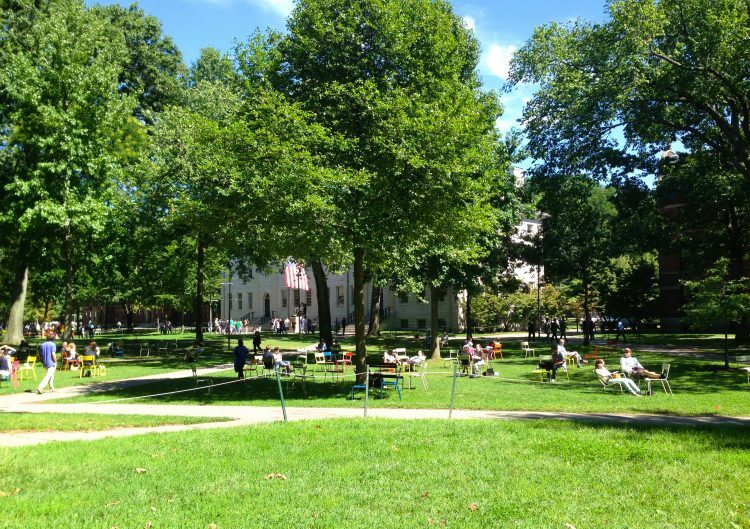 Even if you don’t plan to spend a lot of time exploring Harvard, take a few minutes, sit on one of those colorful chairs in the shade of the trees, take a look around you and breathe. Let the history, ambiance and nature do their magic and transcend you to a different idealistic reality, the reality where education, knowledge, truth and values mean something. The kind of idealistic reality that lives not only in the epic, intelligent and romantic books on the dusty shelves of the libraries, but also in the hearts of many of us. I did not come close to a full understanding of what exactly makes this University so elite, and how could I after spending just a few hours there? What I left with, was a feeling of deep respect. A profound respect not just for its name, but mostly what stands behind it: its history, perseverance, dedication and all the altruistic, philanthropic and intelligent people it took to make what it is today, one of the best Universities in the world. These are my ways to explore Boston area. However, there are many ways to explore the world, and everything untangles ones you discover what makes you tick and what you are really passionate about. Be curious, adventurous, and come up with your individual ways to explore. Be it a Boston area or the whole world! Have you ever been to Medford/Somerville/Cambridge area? What have you discovered there? This is a comment to the website creator. I came to your 5 ways to explore Boston area page by searching on Google but it was hard to find as you were not on the first page of search results. I know you could have more traffic to your site. I have found a company which offers to dramatically improve your rankings and traffic to your website: http://hdmh.info/37 I managed to get close to 500 visitors/day using their service, you can also get many more targeted traffic from Google than you have now. Their services brought significantly more visitors to my website. I hope this helps!